At Mo’s we use only the choicest cuts of meat and pork ribs smoked for hours in our hickory smoker, then barbecued to perfection over a live oak pit on site . All of our sides are homemade with only the freshest ingredients. We do all the work for you. We set up, serve and take down. We provide the buffet tables with tablecloths, serve from graniteware and provide quality paper plates and plastic ware. 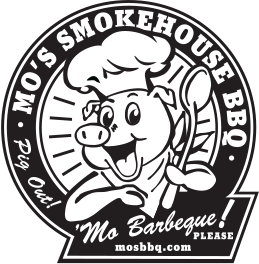 Whether it’s a family BBQ, a wedding reception, or a company BBQ, you can be assured that Smokin’ Mos’ staff will give your function our undivided attention. If you’re looking for some mouthwatering BBQ that covers all the bases, this is it! We’ve been doing this party pack for years with great success and very satisfied customers. It includes our delicious smoked ribs, BBQ chicken and our oak roasted tri-tip. All of our homemade sides and everything you need to serve your friends and family. Enjoy! This is the combo packs little brother. The picnic pack offers up our Sweet Carolina ribs along with our savory BBQ chicken, beans, potato salad and corn muffins with honey butter. Mmmmmmm ! If a sandwich is what you’re looking for, this is perfect. We supply your choice of two shredded meats, sandwich rolls, and your choice of two of our homemade sides. Beans, potato salad or coleslaw. Includes plates, napkins, plasticware and serving utensils. Choice of two shredded meats ( pork, chicken or beef ). Choice of two of our homemade sides. Plates, napkins, plasticware, serving utensils. We have 25 years of catering experience. You can be confident that we will make your special event a successful one. Whether it’s a family BBQ, a wedding reception, winery event, birthday party, anniversary or a company BBQ for 500 or more, you can be assured we will give your function our undivided attention.